James Kennedy performs contemporary and straight ahead jazz , latin, rock/fusion, and more on 6 & 12 string electric & acoustic guitars in a solo, duet, or trio setting. Past performances have included the Montreux, North Sea, and Euro-Disney Jazz Festivals, as well as a variety of other European venues.The group tours regularly in the U.S. The style has been called "Midwestern Contemporary Music" since it combines jazz, contemporary and world influences filtered through the Heartland of the Midwest. This distinctly Midwestern flavor sets James apart in a market full of cliches and clones. You will certainly understand why James has received international attention for their performances and recordings. Looking for a fresh breeze of musical excellence to spice up your music repertoire? Look no further. Meet James Kennedy, jazzman/rocker/fusionist extraordinaire. From his home base deep in the American Heartland (Iowa), James brings forth a wonderful, personable style of music that ranges in depth and flavor, often branded a sort of "Midwestern Jazz." Sometimes reminiscent of world music, other times of rock, jazz and more, this internationally acclaimed artist can do it all and has. Kennedy has taken his style and shared it with an ever-shrinking world. From the west coast to the European Continent, Kennedy is an artist that his native Iowa should be proud of. Current group members include Kennedy on guitars, Matt Alles on bass, Catherine Lawson on violin, and Eric Madison on drum set. RadioIndy created a CD Announcement Press Release for James Kennedy on Digg.com! 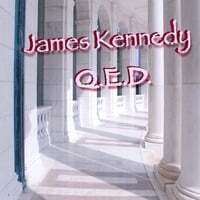 FANS - Please checkout James Kennedy iTunes page play / purchase some great new music! RadioIndy is pleased to announced that we have published our CD Review of James Kennedy music to CD Baby. FANS - Please checkout James Kennedy online! FANS - Please checkout James Kennedy page and sample / purchase some great new music! "Q.E.D." is the latest album released by the prolific guitarist and composer, James Kennedy. The musical style on this new CD has been described as "Midwestern Contemporary Music," since it is really an amalgam of jazz, blues, and folk, all led by James' playing on the 6 and 12 string guitar. Yet he also incorporates a good amount of Latin and World music influences, so it is a difficult album to quickly describe. "Down To the River" is a slower, folksy tune that uses the violin and guitar to paint a mental picture of antiquated American river life. Then, in "Raiders of the Silk Road," we have a very different tune, in which ambient noises and exotic sounds are used to create a feeling that’s straight out of The Arabian Nights. For "Your Love Spell," James opts to let the guitar do the talking in a smooth and pleasant love song. "Q.E.D." is perfect for those who enjoy instrumental albums that can paint pictures of different places in your mind. It is also a great album for those who enjoy the guitar and violin, as there are many instances of beautifully played interactions between the two instruments.